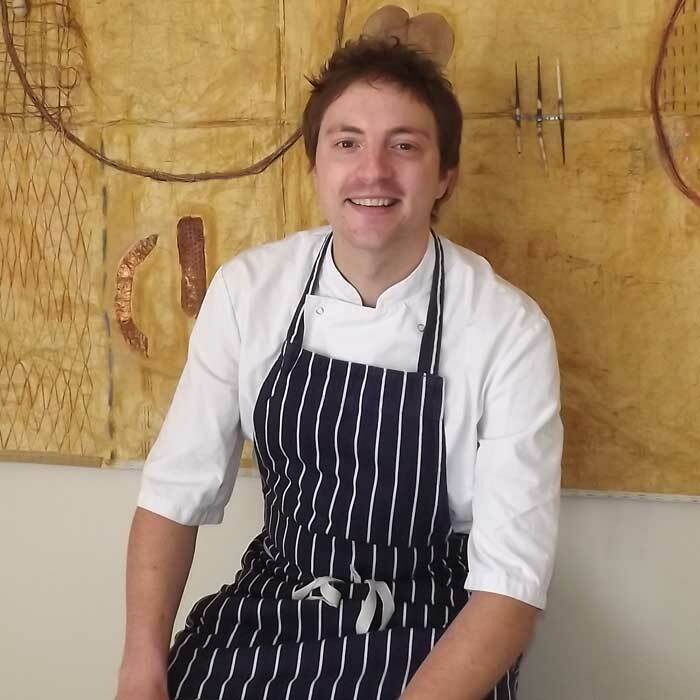 Graeme Pallister of 63 Tay Street chats about his life as a chef and gives try at home recipes using seasonal produce. Some of you may know that I work with Slow Food UK as part of their Chef Alliance; I’ve been doing this for about 3 years now (since it started) and its something that I’m very passionate about. The idea is this…. So, we’re basically a group of chefs who all share the same ethos and want to work together to promote the benefits of eating, cooking and shopping local. This message is carried through our own menus and restaurants and into our wider communities wherever we can – schools projects, the taste adventure and local slow food dinners are all part of the plan! The Forgotten Foods programme was set up last year by Slow Food UK and is part of the Chef Alliance project. It started by encouraging us chefs to use seasonal Forgotten Foods in our restaurants with a view to raising the profile of the artisan producers involved and spreading the words “Eat it or Lose It”. (There’s a list of Forgotten Foods on the Slow Food UK website – here). Of course, this evolved organically (no pun intended!) into new relationships between the chefs and producers involved and this has helped us further protect these “endangered” foods. This year, Slow Food UK decided to develop a recipe collection using only Forgotten Foods. They called on the team at the Chef Alliance and challenged us to create and develop new dishes that would get keen cooks across the country excited to try these fantastic, forgotten ingredients at home. I chose the Manx Kipper – wouldn’t you given a choice? 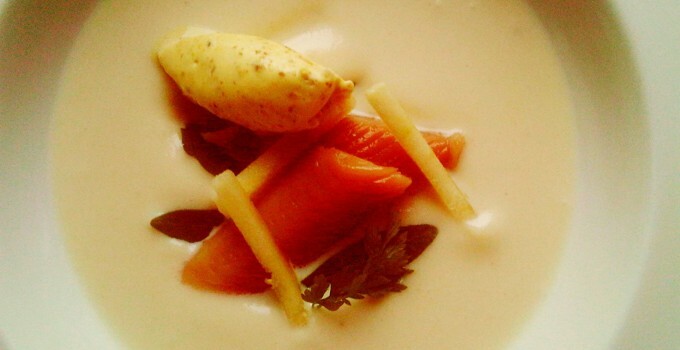 – and brought it up a few flavour notches with a curry cream and fruity apple soup. For me, smoked products can be a bit of a hit or a miss but I loved these Manx kippers from Devereaus. Peter Canipa, who owns the company, will tell you about the uphill battle that his family faces in reminding us all what real kippers should taste like. Forget the cheap knock offs made with liquid smoke and dye – this is the real deal and you can see, smell and taste the difference. I’ve always loved kippers – especially for breakfast – and I wanted to try something different for the Forgotten Food Bank. A kipper soup seemed suitably different! Peter’s Manx kipper has a light, smokey flavour and a moist texture. The creamy, slightly acidic soup complements this perfectly and the curry spices bring the whole thing singing together. Gorgeous! Check out the Slow Food Recipe Bank for more great ideas from my fellow Chef Alliance members. Sweat the celeriac in the butter with a pinch of salt before adding the apple. Place a lid on top and steam until softened, stirring occasionally. Add the milk and cream, bring to the boil and then gently simmer until cooked through. Season to taste, blend and pass through a fine strainer – season again using half of the lemon juice. Place the kipper, still in the packaging, in a pan of lightly simmering water for 6 minutes. Meanwhile, toast the curry spices in a dry pan until aromatic and blend with the cream and remaining lemon juice. Season to taste. Gently pick several flakes from the warm kipper and serve as shown. We run a Slow Food Dinner on the first Wednesday of every month at 63 Tay Street – 4 courses of local, seasonal produce for £25. Ralph chooses a flight of wines and the whole things is very convivial! Come along and join us, we’d love to see you. The next date and menu is always available on our website – click here. Veal – Should It Stay or Should It Go? Lamb, Hogget, Mutton – Let’s Chat Sheep! Apples – Hello Old Friend! Mussel In – It’s Time For A New Tea! The Dreaded Christmas Lunch Dismantled! 2015 So Far – Juicing and Sun Salutations! WHAM BAM THANK YOU LAMB! Can A Chef Write A Wine Blog? The Great Partridge Race and How We Do Wine! THE ONLY TIME I’VE DREADED SOUP!